Try the fun puzzle game! 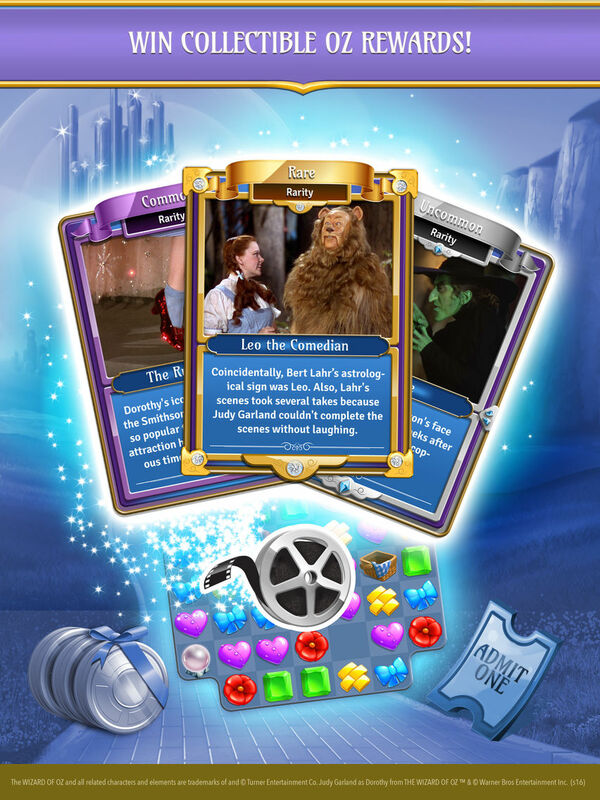 ﻿Take a look at the all-new goodies coming your way in Wizard of Oz: Magic Match! -Meet Glinda and the Munchkins in an all-new area, fill with exciting levels! -Speed up your adventures through Oz with new, faster play! -Go further than you ever have before with beautiful levels and immersive play! ﻿Something mysterious is coming to Wizard of Oz Magic Match! ﻿Take a break with Dorothy and her friends in the latest release from Wizard of Oz: Magic Match! -Test your matching skills as you progress down the Yellow Brick Road with our newest batch of levels! -Match your cunning against the Wicked Witch to earn stars and other great prizes! -Explore the magic of the Land of Oz, and meet your favorite characters from the classic movie as you match your way to victory! 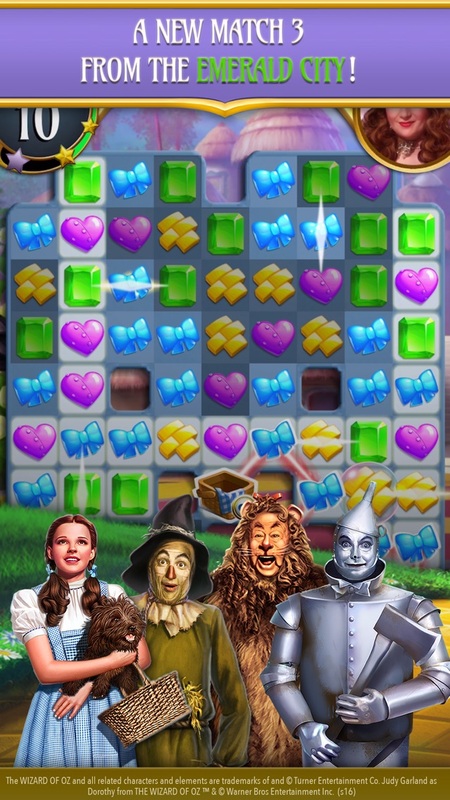 ﻿A new flurry of excitement is waiting for you in Wizard of Oz: Magic Match!  -Explore our newest region: Wicked Witch of the East. Conquer the Witch Fireball hazards to save the people of Munchkinland! -Beat a level with a present on it to win rewards in Glamourous Gifts! 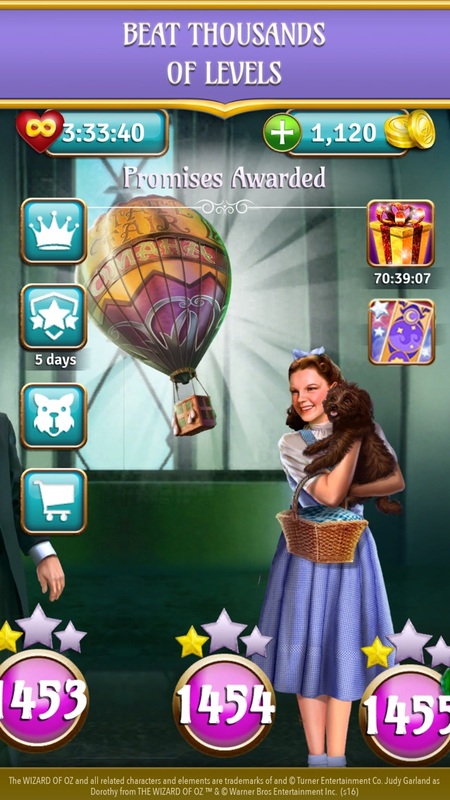 -Earn yourself fantastic rewards with a new and improved Toto’s Tasks! 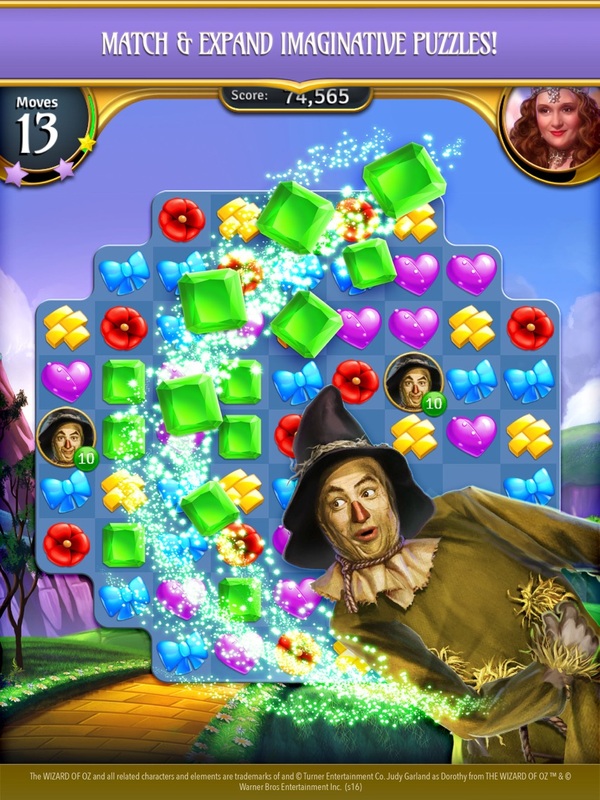 ﻿Magical excitement awaits you in the latest update from Wizard of Oz Magic Match! -Explore further down the yellow brick road with an all-new set of levels! -Use your cunning to get past the Wicked Witch’s Fireball hazard! -Earn rewards from an updated Toto’s Tasks! ﻿Join Dorothy and her friends as the excitement builds in the Land of Oz! -Get exclusive daily rewards based on your play with our all-new VIP Program! 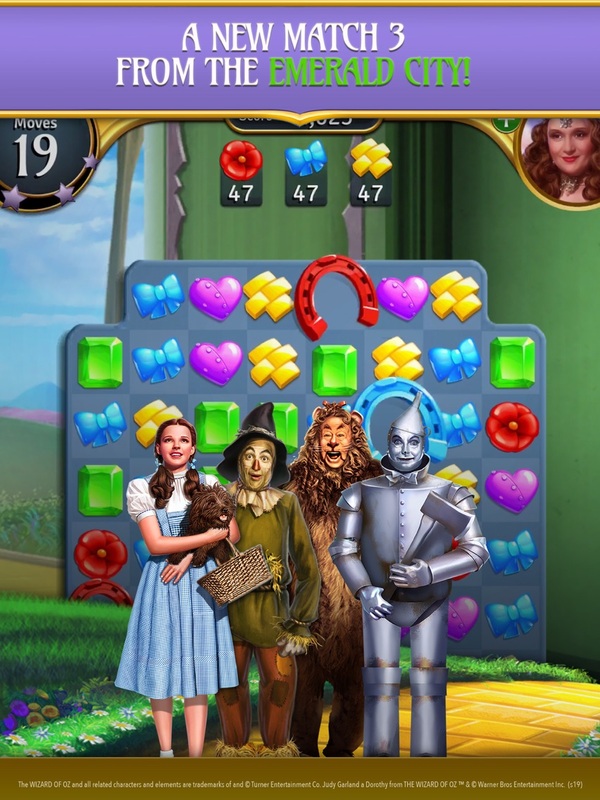 -Explore excitement over the rainbow with 80 new Land of Oz Legends levels! Enhance Dorothy’s Daily Bonus by maintaining a streak for consecutive days! -Maintain your daily streak in the Daily Bonus to collect ALL-NEW Power-Ups! 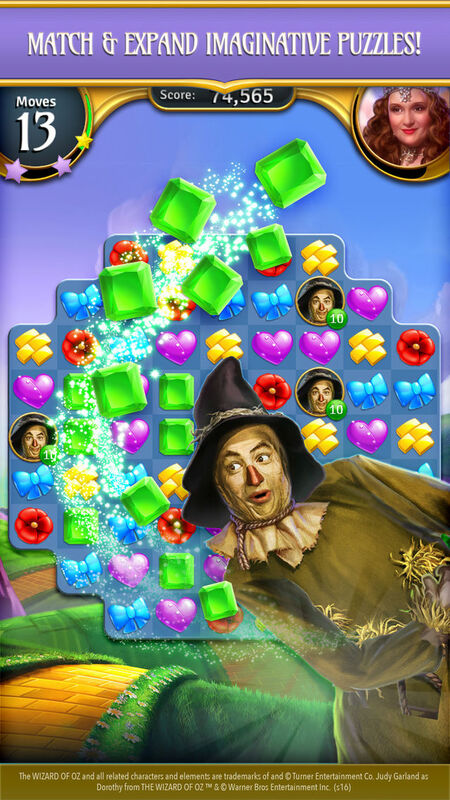 -Go beyond the rainbow with 100 new levels in the Land of Oz Legends! -For the first time ever, play bonanzas, streaks and more events in Land of Oz Legends! ﻿Take on Professor Marvel and his puzzle defying magic as you unlock new, more challenging, levels! Come celebrate our second anniversary with an exciting new look and feel to explore and enjoy! As always, the Munchkins have been hard at work; tweaking, balancing and refining levels. ﻿Miss Gulch is on the move! Help Toto escape her basket as you unlock more new, fun and challenge levels. Toto is on the loose in Miss Gulch's Garden! Help him hunt for bones in these 60 new, fun and challenging levels as you re-visit your favorite Wizard of Oz moments. As always, the Munchkins have been hard at work, tweaking, balancing and refining levels throughout the game. ﻿There’s no place like home. Welcome Dorothy back to Kansas with 60 more fun, new and challenging levels! The team is here listening and working hard to improve the game. Found an issue with the game? Please reach out to our amazing Customer Service team @http://bit.ly/29Vu2CU. We want to hear from you!" 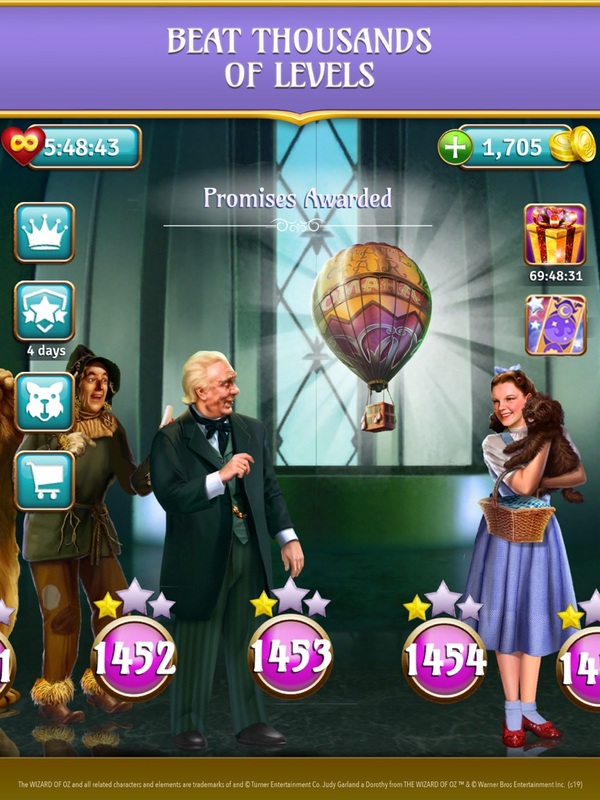 Gather your courage and find a massive number of new levels in Land of Oz Legends. There are hundreds of never before played levels for you to explore. Also, new in this version: League play! Win stars and earn points toward your team goals! Found an issue with the game? Please reach out to our amazing Customer Service team @http://bit.ly/29Vu2CU. We want to hear from you! Close your eyes and tap your heels three times as you help Dorothy return home from The Land of Oz. Solve puzzles using Ruby Slippers in new, unique levels. We have also updated hundreds of levels to ensure just the right balance between challenging and fun. Come back! Come back! The Wizard is floating away! Hot air balloons are soaring across the sky in these new, fun and challenging The Wizard of Oz levels! Control the winds and guide the balloons back to the ground as Dorothy watches her only path home float away. Celebrate the New Year with new and exciting Wizard of Oz levels! Tests your smarts by outwitting the Wizard, show your courage by going up against the Wicked Witch and prove your heart by helping Dorothy along the yellow brick road all the way through our new region where "Promises are Awarded"
Celebrate the holidays with Dorothy and friends with a new Limited Edition Power Up thats worth making the Nice List for! Join us for new holiday events, new levels, a new level hazard (Curtains! ), bug fixes, and more! We’ve also made lots of improvements for issues that our wonderful players have submitted. As always, we strive to improve with each release. If you’ve found any issues with the game, please reach out to our amazing Customer Service team @ http://bit.ly/29Vu2CU. Thank you, and we want to hear from you! Help Dorothy and her friends finish the Wicked Witch! The all-new Water Spread hazard will end her wicked reign once and for all! Help Dorothy escape the castle as you dodge hazards and traverse paths in all new levels. Be on the look out as there is more than meets the eye with these new puzzle boards! We also updated the loading screens and have been hard at work fixing player reported bugs. The team here is listening and working hard to improve the game. We thank you for your support! Found an issue with the game? Please reach out to our amazing Customer Service team @ http://bit.ly/29Vu2CU. We want to hear from you! Our unlikely heroes have snuck into the Wicked Witch’s castle! - Help the Tin Man, Scarecrow, and Cowardly Lion save Dorothy! - Look out for new levels with a HOT new hazard! - Enjoy a bunch of technical fixes and upgrades to the game! It’s a Twister! An all-new event is coming your way! - Save the farm in the new Twister event! - Keep your eyes peeled for the March of the Winkies! - Dozens of big tech upgrades to improve all our wonderful players’ experiences! - Two all-new events have been added: Beam Bonanza and Bubble Bonanza! - New levels will be rolling out in the “Mountain Climb” region! - The new Boulder hazard is on the loose!